The greatest treasures attract the fiercest guardians. Not all treasure comes in the form of money. Rare loot from boss battles can be more valuable than cash - but some treasures are better left alone. from "Perwar Chronicles, Chapter 3: A Hero's Burden"
In the Core Rules, budgeting is simple. A minifig is worth one minifig. A Horse is also worth one minifig. A Hero is worth one Hero, which is a different thing altogether. But if every player has the same number of minifigs and Horses together, and the same number of Heroes, then their armies are equal. If not, then they have an opportunity to decide whether equality is something they care about to begin with. Customized Creations make budgeting more complicated. The relative values of an orbital battlestation, an ammunition barrel full of minifig babies, or the Humans' family dog running in and stomping all over the construction-brick battlefield are not equal to one minifig. The wider range of possible units and constructions may lead logistically-inclined players to consider a more nuanced form of accounting, even if they ultimately reject it and go right back to blowing everything up without regard to the price tags. Like the rest of BrikWars, how players handle team balance and budgeting is more a matter of personal taste than any one system set in stone. Depending on the group's goals and play style, there are four options for dealing with accounting. Preemptive Attack is the recommended and most popular bookkeeping system among minifigs and BrikWars players alike. Based on the system of budgeting used in the Core Rules, Preemptive Attack allows players to avoid accounting overhead through an innovative technique. Once the armies and battlefield are assembled, players immediately begin the game and attack before any of their opponents have time to worry about budgeting. Enemy budgetry can't always be prevented. Some players might try to thwart this system by running their army calculations in advance before even showing up to the battlefield. In a case like this, the solution is to ask them a simple question about their budget, wait for them to start talking, and then immediately attack. For impromptu battles, players don't have to bother with budgeting at all. Instead, they put all factions' combined forces and equipment in a pile between them and take turns choosing assets for their teams in a Military Draft. Players can divide up the Draft options however they like. It can be as granular as picking out individual minifigs, weapons, and vehicle parts one at a time, or as chunky as choosing between pre-equipped minifig squads, fully-loaded warships, and pre-built military bunkers. There's no need to worry about whether all the options are equal or balanced, since all players are choosing from the same supply, but in order to maintain the illusion of fairness, the player who divides up the pile for everyone to pick from should then take the last spot in the Draft rotation. Military Drafting doesn't have to just be about weapons and personnel. Players can mix in all kinds of items to add variety. Turn Order. In a tight battle where initiative is a decisive factor, players can draft for who goes first. Battlefield starting locations. The last player to pick a starting location gets stuck with whichever's the last one remaining. Random stacks of Bennies, making a faction smaller but more unpredictable. Victory Objectives. Players with these objectives gain more options for victory than just trying to be the last faction standing. Bonus Objectives. Players who achieve these objectives receive a special in-game bonus - reinforcements, Bennies, or special events. In the scramble of rapid mustering and deployment, minifigs have limited time for paperwork. Rather than assigning stats according to entries in an accounting spreadsheet, it can be easier to base minifigs' Specialties on their equipment loadout using a property-based system of CAPITALISM. 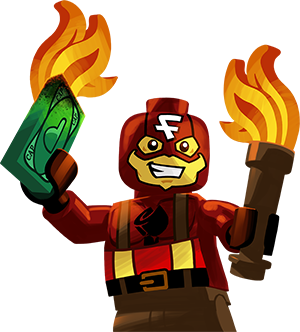 lowercase f, CAPITAL A's evil nemesis, commits atrocities against CAPITALISM in a quest to trick minifigs into thinking that their worth isn't determined by how much extraneous wealth they generate for their corporate owners. lowercase f was, of course, invented by the corporate owners to be humiliated by CAPITAL A on a weekly basis to show the superiority of CAPITALISM. In the earliest incarnations of the BrikVerse, minifigs were divided into strict castes determined by headwear. The first three hats were handed down from the ProtoFig forebears of BrikVerse #1,977: flat-topped POLICE hats, ten-gallon COWBOY hats, and GIRL pigtails, corresponding to the three ProtoFig genders of sir, dude, and ma'am. Three more were invented by the first minifigs of BrikVerse #1,978: the CASTLE helm, the CITY hard hat, and finally the helmet of the Deadly SPACE Man. This hat-based system, known as CAPITALISM, gave order and stability to all minifigs' lives, along with immediate justification to murder each other over haberdashologikal conflicts. Over time, CAPITALISM fell out of favor, thanks to the continually-expanding explosion of new CAPS and job roles in subsequent BrikVerses. It retains pockets of support among konservative and fundamentalist factions who hold to an originalist reading of minifig identities. This is particularly true in the United Systems Alliance, thanks their state hero, CAPITAL A. By replacing his removable CAP with an unremovable CAPITAL A tattooed onto his own face, CAPITAL A has remade himself into CAPITALISM's apotheosis and avatar. It was CAPITAL A who shared his dream with the people of the United Systems Alliance that they could one day live in a nation where they would be judged not by the type of their hat, but also by their car and their consumer electronics and the contents of their weapon holsters. Under CAPITALISM, minifigs aren't defined by anything so esoteric as their thoughts or souls or what's in their hearts. Just like Humans, minifigs in a CAPITALIST system have no identity or value apart from their material possessions, and they're not just willing but eager to sacrifice the lives of friends and family for sweet, sweet meaningless items. CAPITALIST minifigs are sorted into jobs based on their uniform and equipment. A scientist doesn't become a scientist by wasting time studying in some school or laboratory. He's a scientist because he has a lab coat. A Hero is a Hero because he has a cape, a Heavy is a Heavy because he has a weapon that's Too Big, and a galaxy-spanning space civilization's Divine God-Emperor is granted the title as a consequence of having the fanciest hat. The piece of clothing or equipment that determines a minifig's role in life is his Career Assignment Piece, or CAP. Once a minifig receives his CAP, he's stuck with the job it assigns, even if he scavenges different equipment later or loses his own CAP through misadventure or criminal sentencing. (De-CAPitation is the harshest form of CAPITAL punishment). A CAP can be any item, from a pair of binoculars (making its owner a Scout) to a jet fighter (making its owner a Pilot). Minifig Specialist jobs have default CAPs, but players should feel free to make up their own CAPs according to their available brick collections and desired military theme. Under standard CAPITALISM, a minifig's first CAP-assigned job is permanent. In more libertarian forms of CAPITALISM, minifigs can change careers at will, simply by picking up different equipment. A lowly janitor can grant himself an instant promotion to Medik Hero by picking up a syringe and a cape, letting him skip years of Medikal study and hours of Heroic posturing. Just as easily, a Medik and Hero can find themselves demoted to rank civilians by getting bamboozled by a janitor. Laissez Faire CAPITALISM results in even greater anarchy than usual BrikWars, and gives players the option to skip boring pre-battle loadout selection in favor of hordes of unarmed minifigs making a mad dash for equipment caches once the battle begins. It's particularly appropriate for FPS deathmatch arenas and scenarios based around Black Friday mall-looting shopping sprees. If players insist on calculating the value of their armies, everyone in the area should immediately stage a Preemptive Attack as described above, even if they're not part of the game and are complete strangers. If the players continue to insist, then they can quickly assess their forces' value by measuring their Unit Inches. The value of a BrikWars army is measured in Unit Inches, with one Unit Inch (Ű) being roughly equivalent to a single minifig. A unit's value can be appraised instantly by a quick measurement of its Size, allowing players to quickly compare standings on the fly. 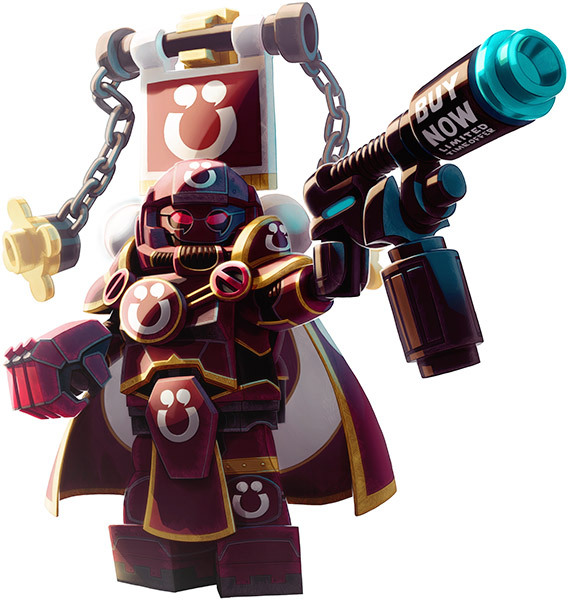 The fighting minifigs of UltraMaroon™ Colour Guard™ protect the trademark dirt-crimson color palette of GrimDark Worst-Schlock, in between advertising their sevices as collectible mercenaries. Their proud logo, the Unit Inch, is emblazoned on every available surface, serving as both their battle standard and their individual price tag. An army's strength is in its capacity to deliver force, using the power of a regular minifig as the standard of measurement. A typical minifig, appropriately armed, delivers two dice of effect at a five inch range. This is the standard effectiveness per inch for all combat-ready units, roughly speaking, and so Humans quantify an army's power in the measurement most important to them: Unit Inches, or Ű. A standard unit is worth as many Unit Inches as its Size in inches, and the Unit Inch value of an army is roughly the sum of the Sizes of all of its combat-ready minifigs, Creatures, and Vehicles. Whatever isn't a unit isn't counted. Weapons, devices, and ammunition are ignored; their effective value is naturally limited by the Power and Actions of the units needed to operate them. Buildings, scenery, and terrain conditions are uncatalogued set dressing. Civilians and unaligned bystanders are treated as expendable decorative elements rather than units, more useful as spectators or target practice than as meaningful participants. Minifig casualties, escaped Horses, abandoned Vehicles, and other neutralized assets are written off as acceptable losses. When a unit has taken Size Damage, its Unit Inch value is based on its Effective Size, not its actual Size. Whenever a Creation varies from the baseline standard for its Size, Unit Inch budgeting uses a series of simple Creation Mods to keep similar-sized Creations at similar-sized values. Creation Mods are added in pairs of Pluses and Minuses: for every Plus added to a Creation, a Minus is chosen to balance it, and vice versa. An attack tortoise might be well-armored for its Size but slower, a barbarian might be stronger but dumber, and a luxury rocket-powered riding lawn mower might be faster but more expensive. Measured from the top of the skull to the base of the spinal column, the minifig is a Size 1 Creature. Example: A Minifig's stats can be calculated the same as any other Creature. Ignoring the Surface-element arms and legs, a minifig's body and head have a Size of 1". As a 1" Creature, a minifig is worth 1Ű. The default stats for a 1" Creature are Action: , Move: 0", and Armor 1d10. Using a Creation Mod to add a +5" Plus to Move and a -1 Minus to Armor (reducing it to the minimum 1 , simplified to 4), the minifig is ready for action. If a battle is bogged down by turtling forces and tactical stalemates, it doesn't mean players have to helplessly watch as tedium steals their victory. Instead, players can turn up the action. By default, a Creation has as many d10s of Armor as its Size, up to 3d10. A Plus to Armor adds a single level of Deflection (limited to one). Each Minus to Armor removes one d10 of Armor, to a minimum 1d6 Armor when the final d10 is removed. A Creation starts with twice as many inches of Power as its inches of Size. A Plus to Power adds a single inch of Power. This is hardly noticeable for large Creations, but can make a big difference for Creations of Size 1" or smaller. A Minus to Power cuts Power in half, so that a Creation has only one inch of Power per inch of Size. Each Creation can only take this Minus once. The Tool requirement for some Specialist minifigs acts as a version of the half-Power Minus. By taking up one of their Hands, a Specialist's Tool cuts his ability to use weapons in half. All Creations start out stationary, with 0" Move. A Plus to Move can either add +5" to one Propulsion system (up to 15" Move) or add Flight capability to a Vehicle that already has Move inches. By default, Vehicles take a -1d10 Armor Minus in exchange for each +5" Move Plus, and a half-Power Minus in exchange for their +Flight Plus while in the air. Players can swap these for different Minuses according to preference, making a minifig who runs as fast as a Horse but is as dumb as a rock, or a spacefighter with full weapon Power but no Armor to speak of. A Minus to Move reduces a Vehicle to Half Speed. This isn't usually done at Vehicle creation, but more often as part of an equipment loadout or other effect. When a minifig puts on Heavy Armor, for instance, he's adding a Deflection Plus in exchange for a Half Speed Minus. Creations with an Action become units. Units have an Action by default, either from being equipped with a Mind of their own or by being controlled by an Operator. A Plus to Action can increase the size of an Action die by one, to a maximum Action . Alternately, a Plus to Action can give a unit a Specialty (Chapter 11: Minifig Armies). A Minus to Action reduces the Creature to a Half-Minded state, which might be handled differently than Minuses for other stats. Submissive and Subjugated Half-Minds require a minifig handler to be Useful. Instead of balancing these Minuses against Pluses, these units come with an appropriate minifig handler included. There may be a minifig for each (such as riders for Horses or personal assistants for executive vice presidents), or a single minifig directing a group (such as a houndskeeper for a pack or war dogs or a substitute teacher for a third grade field trip). By default, units are worth their own Size in Unit Inches, with only rare exceptions. Heroes are worth slightly more. Great Leaders are worthless, but insist on being treated as if they had the same value as Heroes. A Creation has no value in Unit Inches unless it's part of an active unit. Stationary buildings and neutral forces have no Unit Inch value. A Minus to Unit Inches drives up the value of a unit by one Unit Inch. Unit Inches make it easy for players to compare the relative strengths of their armies, both at the start of battle and as the game progresses. At the beginning of the battle, if players' teams aren't balanced, any team whose armies are worth fewer Ű than their most powerful opposing team can take one Almighty Benny per Ű of difference. Depending on the degree of imbalance, underdogs can be given other concessions according to the players' tastes, like first choice of deployment location, an extra first turn, or easier combat objectives than their larger opponents. Unit Inches can't stay up forever. A player's Unit Inches go down over the course of a battle as minifigs and materiel are lost to destruction, theft, and abandonment, or as the Effective Size of large Creations is chipped away by Size Damage (7.2: Taking Damage). Unit Inches can be regained as incapacitated minifigs are revived, broken machines are repaired, enemy Vehicles are stolen, and surprise reinforcements appear in the nick of time. When an army is reduced to half of its original value in Unit Inches, or if one side in a conflict has less than half as many Unit Inches as their opponents, it may trigger an Endgame. In BrikWars, when players are finished having fun, then the game is over, even if the battle itself is still raging along. In the best case, everyone agrees on this at the same time. The game ends, and players can immediately jump to deciding whether any side "won" and what the consequences were. Other times, some of the individual players might have already lost the battle, or at least have lost interest in it, while the rest of the table is still eager to keep going. As a rule of thumb, as soon as any one player has lost half of their minifigs or Unit Inches, it's a good time to stop and check how they and everyone else are feeling about continuing. If the tide of battle has brought a player or players to a point where they can no longer meaningfully engage, then it's time to kick off one or more Endgames. How does Mobfather Scratch sleep at night? On a bed made of money. 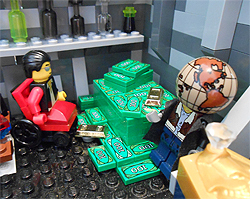 Money has little purpose in the BrikVerse, apart from the normal purpose of all things in the BrikVerse, which is giving minifigs a reason to murder each other. from "Sins of the Mobfather"
If a player has to leave immediately, whether due to ennui, diaper-related emergency, or fatal brain aneurysm, the battle doesn't have to end. That player's forces become Mobs, and they (along with any other non-player-affiliated units in the game) are controlled by Mob Rule. Forces abandoned by their animating Human suffer an immediate crisis of leadership. On a Mob faction's turn, the remaining players take turns picking Mob units one at a time and controlling their Movement and Action. This continues until all of the Mob units have moved for the turn, or until at least half of the remaining players have declined to control any more of the Mobs for that turn. When controlling Mob units, the player with the fewest Unit Inches' worth of remaining forces goes first, and players take turns in sequence afterward. Depending on the preferences of the remaining players, a faction taken over by Mob Rule might continue to behave rationally (or as rationally as they ever did), or there may be no boundaries on what players make them do. A Mob faction can keep its own turn or be combined into a single turn with other Mob forces already in the battle. Forces that are desperate or pressed for time can redouble their efforts, hitting harder but overextending themselves and increasing their own danger in the process. For a team that chooses the Escalation endgame, combat effects are accelerated by an Escalation Bonus that's added to each of their own forces' Action and Damage Rolls, but that's also added to any Action and Damage Rolls made against them. Because the Escalation Bonus increase occurs at the end of the turn, all of the player's enemies will receive the advantage of using the increased Bonus before they do. Escalation is dangerous! If all players at the table agree to accelerate the action together, they can start an Endgame Crescendo of Violence. The next player receives a single Instant Benny at the start of his or her turn. From that point forward, at the beginning of each player's turn, the new player receives one more Instant Benny than the player before them, with no upper limit. If a battle is getting too predictable, or if a new Human shows up unexpectedly and wants to join the fight, players can throw in a wild card with the arrival of a Secret Faction. This depends on having extra forces already built and available to deploy, but for many Human construction toy enthusiasts this isn't a problem. If a Secret Faction is introduced without a player standing by to take control of it, the arriving forces can be controlled by Mob Rule. Soldiers facing defeat still have opportunites for glory. Players who accept that they're Fighting a Losing Battle receive special bonuses as their forces go down in flames. But there are no take-backs - no matter how well they do from that point forward, at the end of the game, those players lose, by whatever Koincidental post-battle disasters players have to make up in order to make it true. Forces that still have a chance to achieve at least one of their objectives, but only if no one gets out alive, can go on a Suicide Run. From that point forward, any time one of their units is killed or destroyed, they immediately recieve one Instant Benny. Regardless of whether they succeed in their objective, at the end of the battle, all of their units are captured or killed. Forces that have already lost the battle, but who'll be damned if they don't take their enemies with them, can go down in a Blaze of Glory. From that point forward, any time they kill or destroy any enemy unit, they receive one Instant Benny. At the end of the battle, no matter how many enemies they kill on the way out, they lose. The best they can hope for is to make sure none of their opponents win either. Forces that can't achieve any further objectives and who are determined to regroup and fight again can stage a tactical retreat with No Man Left Behind. From that point forward, any time they evacuate one of their own minifigs off of a "safe" side of the map - living, dead, or otherwise - they receive one Instant Benny. At the end of the battle, any objectives the player had already achieved before retreating still count as victories. Objectives achieved after calling the retreat are Koincidentally undermined. Any forces that successfully escape live to fight another day. Evacuated casualties may or may not recover, according to the needs of the story.